Occupying an elegant Victorian townhome, The Best Western Corona brings style and detail of the past into the 21st century, with all the convenience of having London at your doorstep. With its central location, the hotel is just a stroll away from Buckingham Palace and close to London's many other popular attractions. Comfortable rooms include free Wi-Fi, flat screen TVs, as well as tea and coffee machines. Breakfast is served each morning for guests wanting to fill up on a hearty meal before exploring the sights and sounds of the city. 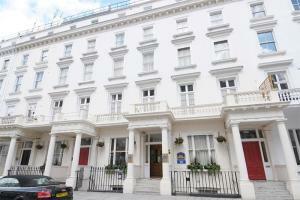 Approximately 13.5 miles from London Heathrow Airport and 11 miles from London City Airport. Victoria Rail Station is about a ten minute walk from the hotel.